We have always been thrilled and ecstatic when it comes to working with extremely talented and incredibly creative people. 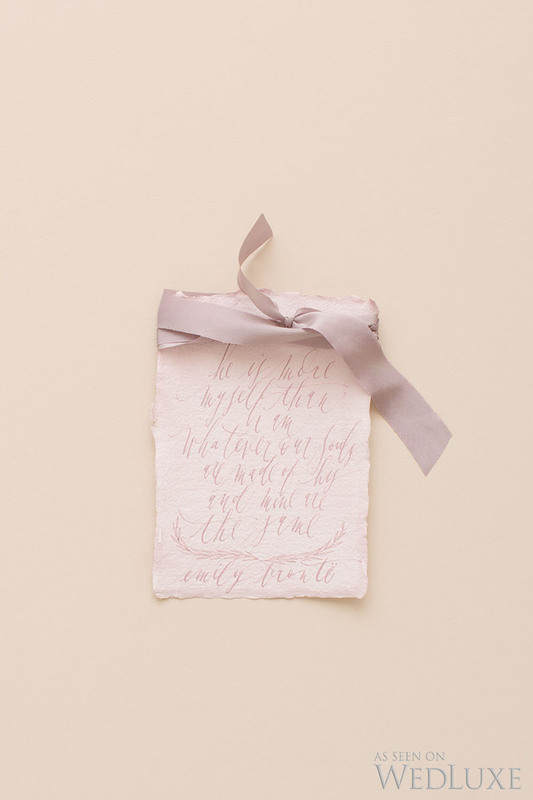 This particular period-inspired shoot for Wedluxe Editorials was a collaboration of some of Toronto’s most brilliant minds when it comes to wedding design, photography, sculptography, and even calligraphy! We are eager to share with all of you this classy and beautiful “The New Romantics” photo shoot which was specifically inspired by the literary movement of Romanticism which spanned from the 18th to the 19th centuries and gave birth to world-renowned authors such as Charles Dickens, Leo Tolstoy, Jane Austen, Geoffrey Chaucer, and Mark Twain. To make this creative wedding photo shoot into a reality, we teamed up with Anna Church, an exceptional sculptographer based in Toronto. What she does is she cunningly combines and creates three dimensional sculptures with the help of photography. Continue reading and follow the process which made this themed-shoot an enchanting one. Anna Church’s “insignia” series collects, combines and assembles specific objects to produce and mimic a sculptural form. After intricately arranging every piece – big and small, she then uses the power of camerawork to capture the essence of the whole ensemble which creates an optical illusion that expertly tricks the eyes and the mind. In this particular “Romanticism” shoot, Anna said that she absolutely adores floral, pastel colors, and anything romantic. So when she was asked to work on ‘The New Romantics’ editorial, she didn’t have second thoughts or any kinds of hesitation because she knew that this specific project will be perfect for her series of insignia as an artistic medium. 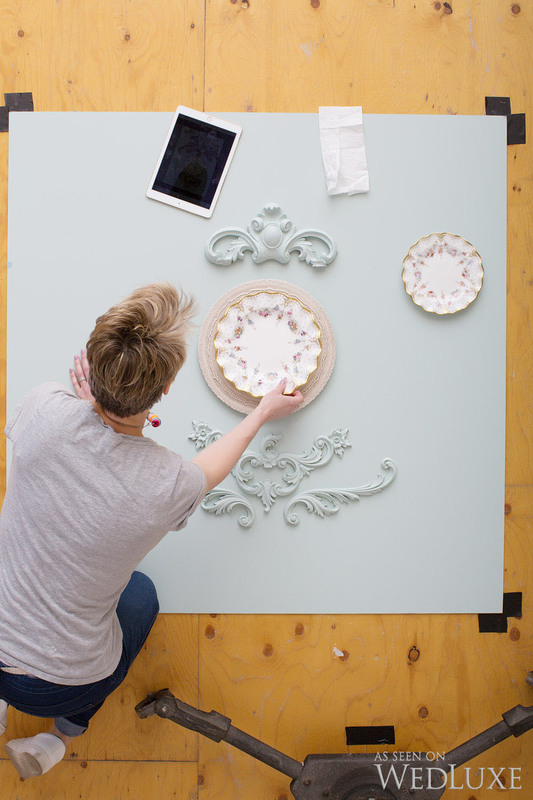 This extremely gifted woman is currently working on an Insignia for a Toronto interior designer and would definitely love to collaborate and work with couples for future bespoke Wedding Insignia projects. 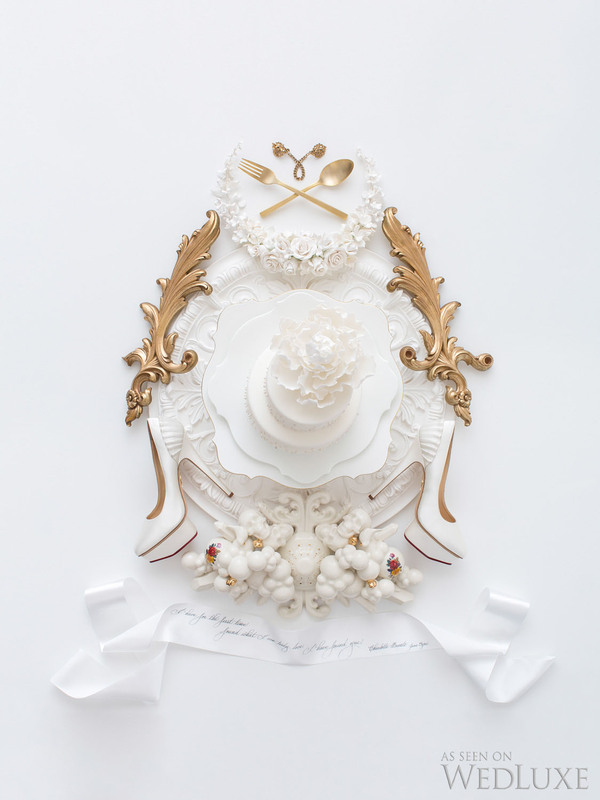 Anna worked together with an expert team of imaginative and inventive calligraphy artists, innovative cake designers and ingenious floral designers which brought life to each unique Wedding Insignia. 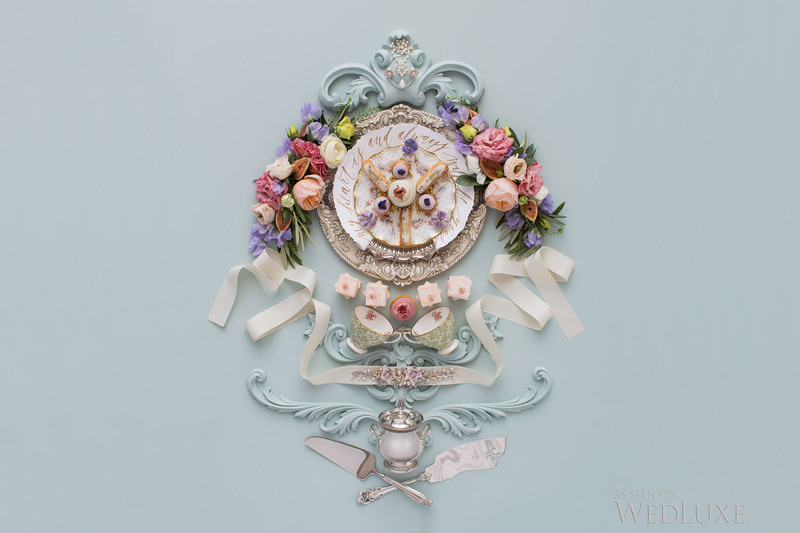 In this special project, Anna reimagined the Victorian era on a whole new level. She envisioned parlors with beautiful sitting rooms, lace draperies painted in hues of blush pink, soft lavender, powdered blue and soft teal, graceful white-washed tablecloths with ivory white ornate pieces of crockery and silver cutlery, accented with gold and marble. From these imaginations, Anna meticulously created an “old world meets new world” three dimensional sculpture. 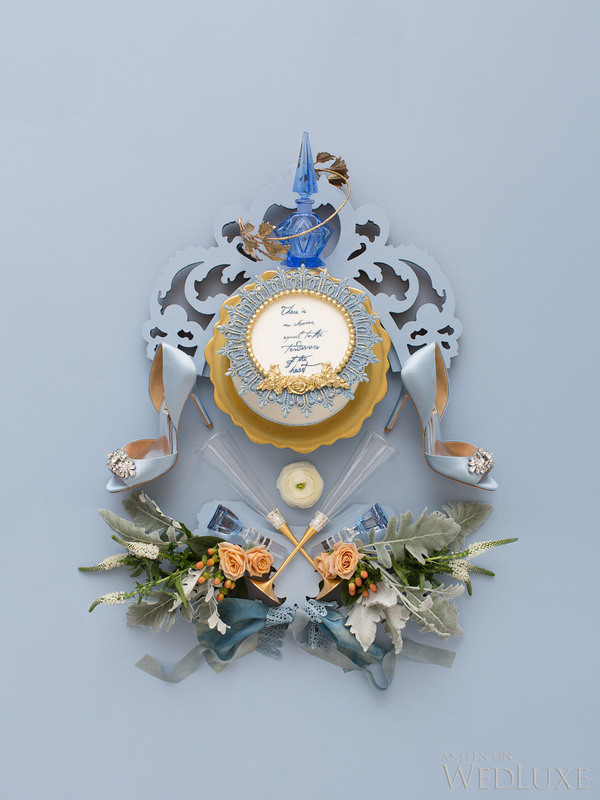 She combined traditional wedding customs that are still widely used until today: the concept of Something Old, Something New, Something Borrowed and Something Blue. She delicately harmonized these customs with her chosen theme of colors, floral designs, cakes, chinaware and vintage motifs to be able to represent the desired insignia. 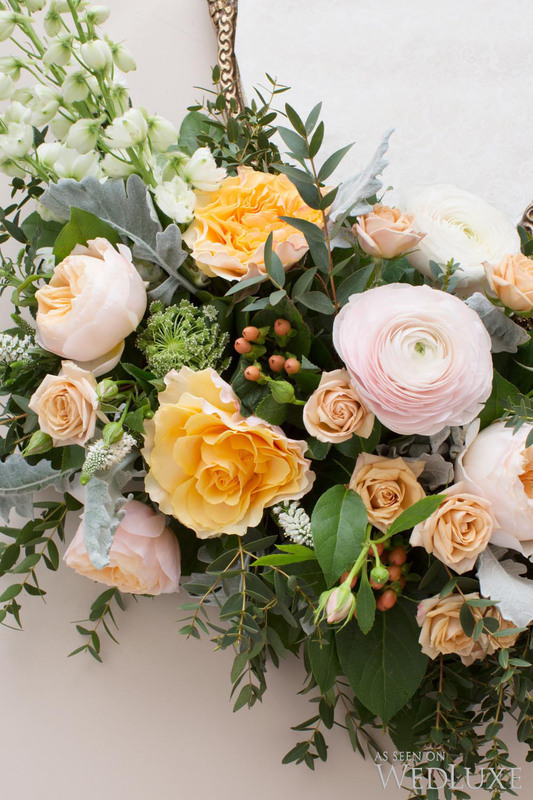 The whole process of the editorial was photographed by our group of professionals and a behind-the-scenes video was filmed to capture the charming and enchanting collaborative work of Anna Church and some of Toronto’s team of wedding experts. The shoot was a celebration of an expression of passionate emotion, nature, love and life. 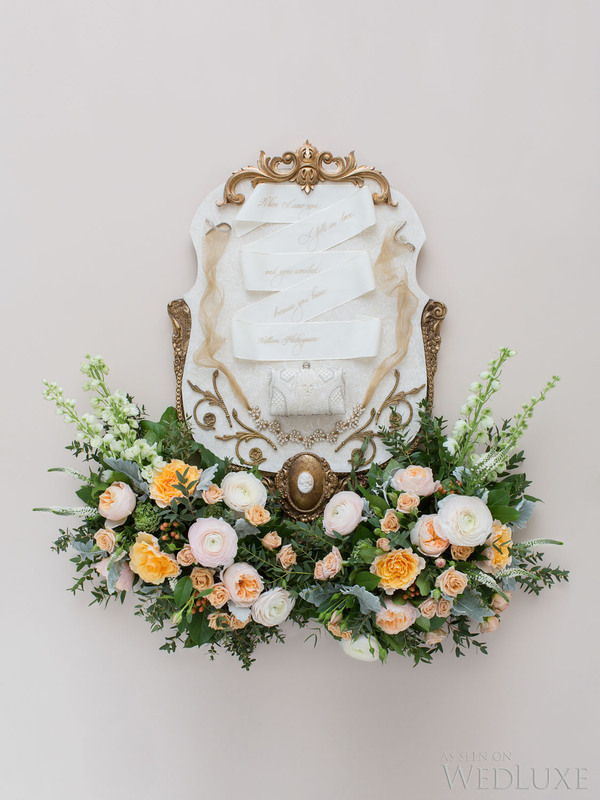 As Anna fashioned the Wedding Insignias piece by piece, she told us that she absolutely loved the collaboration and the opportunity to work with a team of outstanding talents. She also added that the whole experience was magical, exhilarating and nourishing. All the Insignias were brilliantly formed. The “Her” three dimensional sculpture was made to look like an emblem with its play of soft pastel colors. Flowers by Bloom & Company brought life to the ensemble together with the petite choux pastries, macarons, marshmallows and candied violets from Nadia & Co. 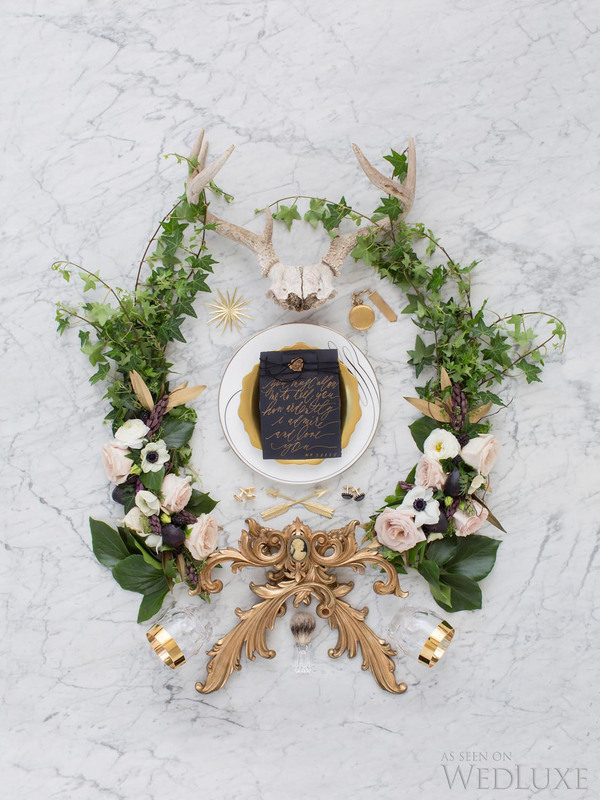 The classy calligraphy by Post Calligraphy written in gold ink on the ornamental plate added drama to the whole setup. The second image which was the Insignia for the “Something Borrowed” looked simply elegant. Blooms from Pink Twig perfectly contrasted with the gold, bronze, and white colors of the clutch, ribbon, and other accessories. 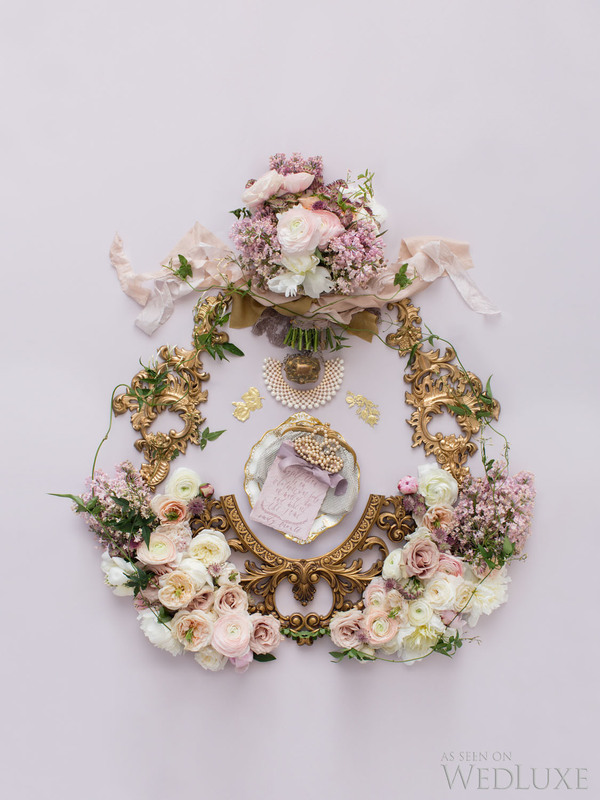 For “Something Old,” the elaborate formation of the pieces created a stunning wedding insignia which played with the color palette of Lavender and Pink. The wonderful flowers were from Caprice Design & Décor, the vintage purse, from Cabaret, the choker, necklace, and trinket box from Gadabout, and the Gold decals from The Paper Place. We loved the fourth image (Something Blue) because it was simple yet at the same time awesome. The powder blue pair of pumps from Badgley Mischka was cleverly positioned complementing the other pieces above and underneath. Who would have thought that crystal bottle stoppers could be used to beautify a period-inspired shoot? It’s so innovative and resourceful! “Something New” spelled “regal.” White and gold really do go together very well and the insignia looked like a crest from an imperial family. 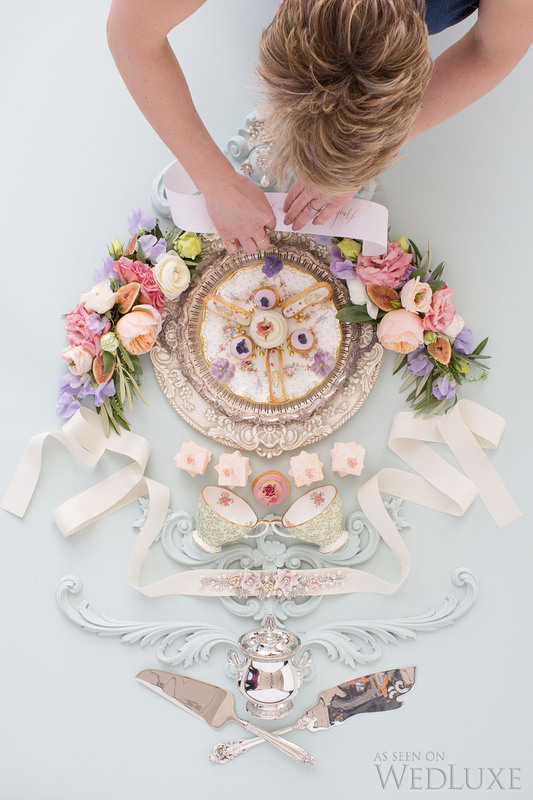 The cake and sugar flower laurel from Bobbette & Belle were perfect for the whole ensemble. 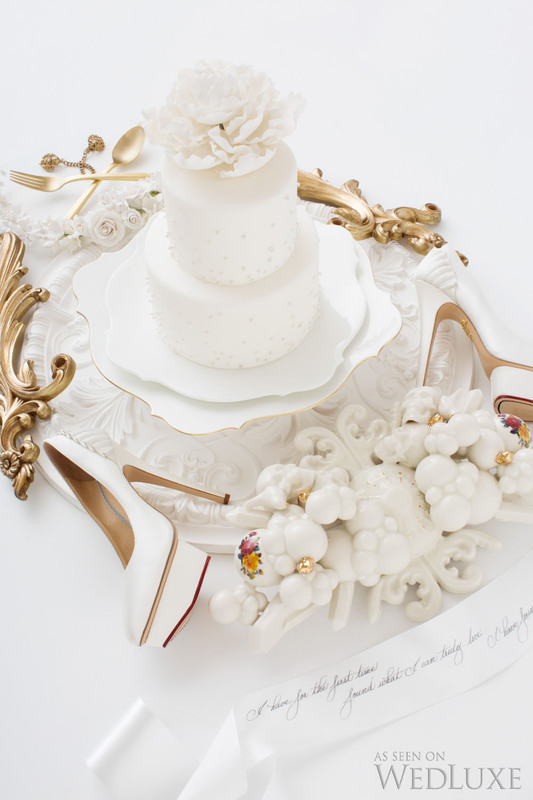 The ceramic pieces and the dinnerware looked delicate over the gold flatware and gold ornate accessories. Last but definitely not the least was the “Him” image. Bloom & Company brought in fresh bloomsl fashioned to look like a headpiece when viewed from the top. 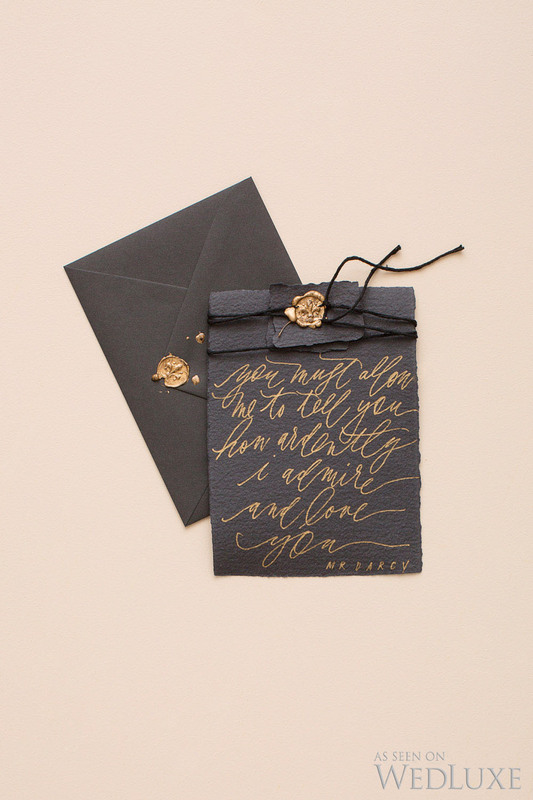 Gold calligraphy on black stationery added a mysterious effect together with the gold cufflinks, pocket watch, brooch, arrow and star decals. The editorial shoot breathed magic and exuded luxury and class. It was definitely electrifying to work with Anna Church and some of Toronto’s leading wedding experts and we absolutely would want to work with them again in the near future! HER (IMAGE 1): FLORAL • Bloom & Company, PETITE CHOUX PASTRIES, MACARONS, MARSHMALLOWS, AND CANDIED VIOLETS • Nadia & Co~, CALLIGRAPHY • Post Calligraphy, DINNERWARE • Royal Crown Derby (DESSERT PLATE), Christofle (SUGAR BOWL), INTERNATIONAL (PIE AND CAKE SERVER), WALLACE (ICE CREAM SLICER) ALL AVAILABLE AT William Ashley China, EARRING AND NECKLACE • Sarah Ana Designs, FLORAL RIBBON BELT • Ti Adoro Jewelry AVAILABLE AT Kleinfeld Hudson’s Bay.